The RG3 Robotic Greens Mower is equipped with sensors that allow the device to avoid unusual obstructions, like gophers that might scamper innocently into its path. 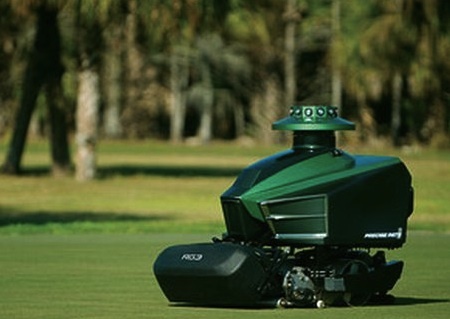 The $30K mower was developed by Precise Path Robotics for the golf course industry. To help with the launch of the RG3 Robotic Greens Mower, the Indianapolis-based start-up just raised $4.5 million in funding from angel backers Scott A. Jones and Charlie Staples to give it $10 million in total backing. Precise Path primarily builds the software and sensor technology for robots, and outsources the manufacturing component, he said. “It’s an extension of computing technology,” said Jason Zielke, the company’s president and chief operating officer. “What’s driving this is that computing has come so far, that [robots] can handle unstructured environments, identifying and compensating for variations in the environment. Suddenly the mower stopped and clicked excitedly.